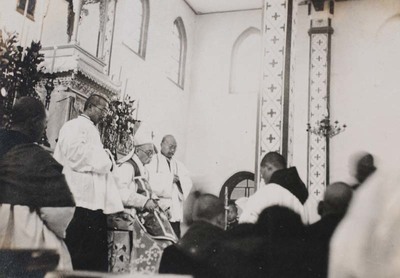 "Clergy and seminarians to mark the 25th anniversary (jubilee) of Fathe"
Clergy and seminarians to mark the 25th anniversary (jubilee) of Father Jean-Baptiste Wang’s ordination Center front: Bishop Melchior Souen (Sun Dezhen 孫德楨), with, to his left, Father Jean-Baptiste Wang (王增義) and Father Vincent Lebbe. Clergy and seminarians to mark the 25th anniversary (jubilee) of Father Jean-Baptiste Wang’s ordination. March 19, 1936. Société des Auxiliaires des Missions (SAM) China Photograph Collection, Whitworth University Library, Spokane.